Canadian Alasdair MacLean has studied composition at Allison University, the Juilliard School, McGill University, the University of Toronto, and at the L’Ecole d’Arts americaines in Fontainebleau, France. He has completed more than 40 professional commissions for a wide variety of musical ensembles and soloists and in a number of contexts including concert music, school music, music theatre, and opera. 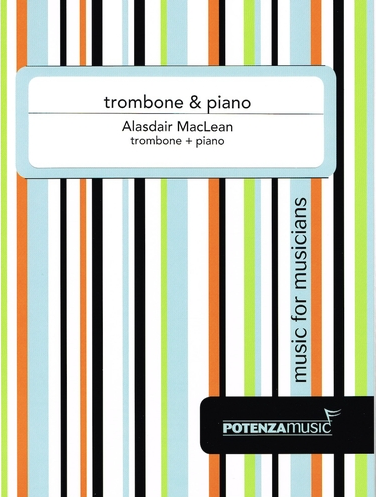 Trombone and Piano was commissioned and premiered by Canadian trombonist Dale Sorensen in 2011. Dale has been involved in commissioning, performing, and thoughtfully archiving Canadian composers' creative output for trombone for over 20 years. He has premiered 20 solo trombone pieces and dozens of chamber works, and recorded an all-Canadian CD of music for trombone: Harambee: Canadian Music for Trombone (Pine Grove Music PGCD-01). I was immediately interested in the idea of blending the sounds of the two instruments which often sound quite disparate in traditional arrangements, so I chose to restrict the piano writing to the same range as the trombone for the entire piece. The loud turbulence of the piano at the beginning becomes a kind of rondo-theme bookmark throughout, and provides momentous foundation that the trombone line rides through and above. A contrasting texture is when the instruments transform into rhythmic and melodic unison, and drive forward as one. In the single movement of this work, the tempo, with small variation, stays quite fast, from quarter note=136 to quarter note=164. The harmonic, melodic, and rhythmic writing is traditional as are the technical requirements for both instruments. The physical layout, paper quality, and printing are superb.